Interested in joining our ESGC Junior Gliding Scheme? Learning to fly a glider is exhilarating and fun and the Essex & Suffolk Gliding Club has developed a Junior Members Scheme for young people aged up to 25 to take up the sport of gliding in a safe and affordable way. 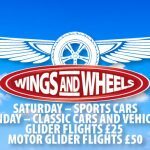 In addition to being trained to fly by our qualified and experienced instructors we want you to join in and help with the care of our glider fleet and learn about aviation. Given the right commitment and regular instruction you could be flying solo within your first year, so why not sign up to our Junior Members Scheme today? The Essex & Suffolk Gliding Club is one of the British Gliding Associations ‘Junior Gliding Centres’ and is supported by ‘Sport England’. We also welcome young pilots from local Air Cadet Squadrons and Combined Cadet Forces. It is now official that young glider pilots can ‘solo’ at the age of 14! Many young glider pilots have gone on to have careers in the RAF and civil aviation. Like to try gliding as a Junior Member? Then why not apply today and email the membership secretary at (membership@esgc.co.uk) for a membership form! Essex & Suffolk Gliding Club maintains a comprehensive child protection policy. Details of which you can find here.